Get OpenELEC Download an SD Card image file from resources.pichimney.com (latest version at the time of writing is RC1 – 2.99.1). Install OpenELEC Unzip the image file and burn it onto a (1GB or bigger) SD card using Win32DiskImager (for Windows) or dd (for Mac or Linux). Plug Everything in Plug the SD card into the RPi. Plug the RPi into your TV (or AV amp/receiver) using HDMI. (Optionally) plug in a remote control (e.g. a cheap Win MCE remote from eBay or a nice Kogan keymote). Attach the RPi to your network. Finally plug in a suitable 700mA power supply. Enjoy The OpenELEC device should now show up on the AirPlay menu on any iOS device connected to the same network allowing music, videos, YouTube etc. to be streamed. I’ve had a number of people ask me recently whether they could possibly get AirPlay working on the Raspberry Pi, and I’ve even seen some much more involved HowTo type articles. 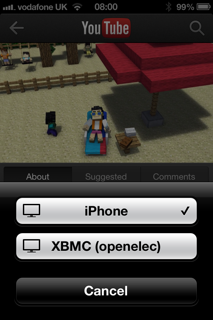 All that effort isn’t really necessary, as XBMC has had AirPlay support for some time, OpenELEC packages XBMC in an easy to use and lightweight container, and OpenELEC is a doddle to install from an SD card image file. I’ve tested this myself with an Edimax EW-7811UN, which is one of the adaptors known to work reliably with the RPi. The only digital audio output from the Raspberry Pi is HDMI. This is fine if you’re AirPlaying video/YouTube, but not so great for music (unless you have an HDMI capable AV amp/receiver or an HDMI/SPDIF splitter). You can of course get audio out of the 3.5mm jack, but whilst AirPlay isn’t audiophile quality anyway the RPi analogue output is likely to disappoint. A USB remote isn’t essential, as there are XBMC remote apps for iOS and Android. It’s also possible (but not very living room friendly) to use a regular keyboard and mouse. If you use your RPi connected to your TV and your TV has an HDMI-CEC interface (like most modern TVs), it’s likely that your TV remote will work straight out of the box.